The first Planes came out last year, and was just "okay"; I gave it a Yes review, but also 3 out of 5 stars, which is generally my lowest "Yes" qualification. I actually prefer this newest installment a lot better: it's more exciting, has more of a plot, and has the same fantastic 3D as the last movie. Dusty Crophopper (voiced by Dane Cook) is now known around the world as a racing champion. However, there's a problem: one of his parts, long discontinued, has stopped working, and unless he gets it fixed, there's no way he can race again. His town just happens to need another fire department employee, and it's decided that he will go off to train in order to become a crophopper firefighter. He's soon involved with a whole new cast of characters, such as Blade Ranger (Ed Harris), Lil' Dipper (Julie Bowen), Mayday (Hal Holbrook), and more, and he must learn how to put out fires before he's dismissed as just another racer. The 3D is again fabulous in this movie, same as the last installment, and I highly recommend seeing it in 3D if you can. The movie starts off with Dusty and his old plane and car friends, but this version seemed to have more "adult" jokes that will fly over kids' heads (no pun intended) - there are two RV campers named Harvey and Winnie (HaRVey and Winnebago - get it? ), for example, and others strategically placed throughout the film. I love it when Disney does things like that, since it makes the movie fun for both the kids (visual imagery) plus the adults (jokes), and it definitely makes the film better as a whole. Yes, see this movie. I will say that because of the fire scenes, it was a little scarier than the last Planes, so I wouldn't recommend it for very young children. There's one scene (no spoilers) where a major character appears to have been injured, and the screen fades to black for a few seconds; a few children at my screening yelled out versions of "no!" and "what?!" during that, which was kind of funny. You don't need to have seen the first film either to enjoy this one, although I do recommend doing so just because this version has some recurring characters like Dusty and his friends. Between the prominent voice cast and the fact that this is a Disney movie, this film should do well at the box office, though, and rightly so. 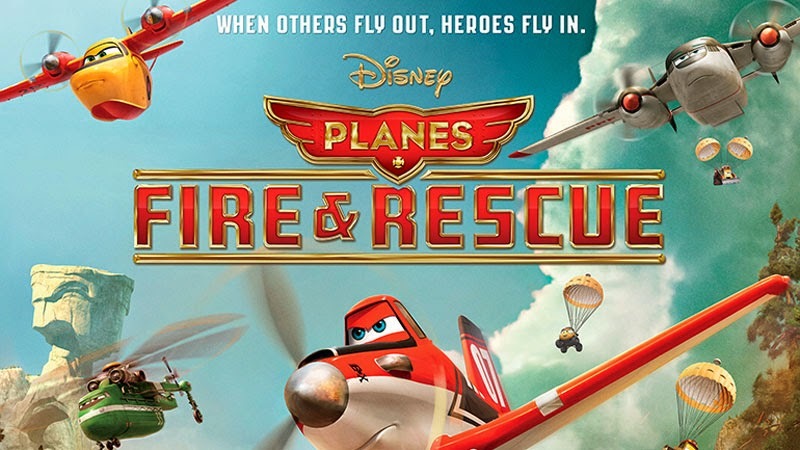 Planes: Fire & Rescue is in theaters today, July 18th, and is rated PG with a runtime of 83 minutes. 3.5 stars out of 5. Had to come check out your thoughts. Very nicely put! I wasn't a huge fan, but it was cute and I did love the adult humor sprinkled in. And I also had to laugh at the part when all the kids in the theater were upset -- too funny! I agree this was a Yes movie. My dd enjoyed it, and so did I. Thanks for sharing your review! Thanks! I think you got more of the references than I did, too :). I thought it would get a higher rating but I enjoyed cars better than the first Planes movie. We loved the first one- Planes and even Cars. So we're looking forward to checking this one out! Because I adore Hal Holbrook, I would love to see this movie. Maybe I will take my dad who is a pilot! He's a great voice actor here! I recently saw Planes: Fire & Rescue and agree with you. This installment was better than the first. The one-liners were very funny and you had to pay attention to catch them. I especially liked the graphics and the realism in the backgrounds. The sensation of flying felt real in 3D. The kids in the audience really got into it too!